Simply put, Ophiuchus is a constellation, not a sign. Constellations are clusters of stars. There are around 88 constellations visible in the night sky from Earth, and since the beginning of time humankind has given them mythological names that reflect their powerful meaning to us, such as Aquila The Eagle and Delphinus The Dolphin. The Astrological Zodiac is an imaginary belt around the Earth based on the Sun’s apparent path from our perspective looking up! Neither reflects the ultimate reality of the Universe, but only how it appears to us. The Zodiac is divided into 12 equal parts, each named after a constellation. This is important to remember. The Zodiac is divided into 12 equal parts, whereas constellations are not equal in size. Some have many stars and take up huge areas of the sky while others are relatively tiny. The names of the Zodiac signs are to remind us of the energetic qualities that are around at that time. In January, a debate arose in the world’s media, and driven by the Internet, around the constellation Ophiuchus and whether it is or should be considered the “13th Zodiac sign.” It was considered a Zodiac sign in ancient times, when there were 13 Zodiac signs and a 13-month calendar, based on the cycles of the Moon. However, given its position between Scorpio and Sagittarius, even if we did return to using a 13-sign Zodiac, Ophiuchus would be the 9th sign, not the 13th. Overall, it is important to remember that the unfolding of time has no divisions in reality; it is all “NOW.” Dividing a “year” into 12 or 13 parts is one of humanity’s ways of recognising, planning, and working with the energy of Nature’s cycles. This is how we know the best time for planting crops etc. Even at its simplest level, we divide the year into four: spring, summer, fall and winter. However, Nature sees no such division, just a seamless unfolding! It’s probably a good thing that Ophiuchus isn’t included in the Zodiac. Because that would be something else that could tempt us to look outward, and distract from our inner journey. Ophiuchus is depicted as a man with a snake. A snake handler. In Arabic Astrology, this constellation was called the “snake charmer.” This is important. Ophiuchus is also shown stepping on Scorpio. Ophiuchus could be said to represent humankind (us) while Scorpio represents desire. The esoteric symbolism of this is that once we have tamed the nine-headed “Hydra of Desire” in Scorpio, then we are ready to go within, following the direction of Sagittarius’s arrow. Buddhist scripture tells of Buddha sitting in meditation while all the “temptations of Mara” were presented to him. Mara represents all the temptations of the outer world that could have distracted Buddha from his inner journey. Only after he resisted all of these temptations did he attain enlightenment. Adam and Eve met a serpent in the Garden of Eden. The Serpent “tempted” Eve with fruit of the forbidden Tree of Knowledge. Serpents are often used in various spiritual traditions to symbolise desire, temptation, or both. In The Labours of Hercules: An Astrological Perspective, by Alice Bailey, the twelve labors take Hercules on a journey through the Zodiac, with his first labor being in Aries and his final labor being in Pisces. This is symbolic of both the individual journey of our Soul and the collective evolution of human consciousness. 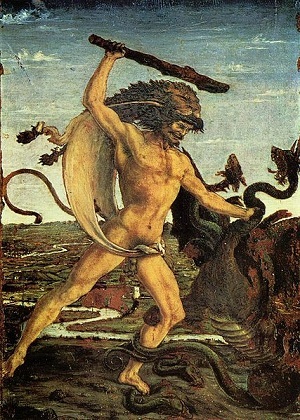 The eighth labor, in Scorpio, requires Hercules to enter a “stench-drenched bog” and battle the nine-headed Lernaean Hydra (Desire). This is similar to Buddha resisting all the temptations of Mara. Each time Hercules cuts off one of the heads of the Hydra, another one appears in its place. This demonstrates the futility of tackling desires one by one and indicates the deeper difficulties we all have struggling with the temptation of desire. Understanding this labor is the key to understanding the Soul Path of Scorpio. After struggling for some time to defeat each “head” individually, Hercules finally triumphs by lifting the Hydra completely into the light, whereupon it withered. Strong in the dark, its power diminished when brought into the light of consciousness. This means when we shine the light of our awareness onto that which tempts us, it loses its power. We tackle desire at the root when we bring our full awareness to it. Irrespective of our particular faith, we each face the same struggle on our spiritual journey, between the temptations of our personality, the outer world that distracts us from our path, and our inner journey toward spiritual progress. This can range in intensity from the simple urge to jump up from meditation because we have forgotten something, to dealing with the deeper emotional and psychological wounds that require our loving attention if we are to heal (become whole). The struggle is in our avoidance of that which we are afraid to look at. We keep it in the dark and are unable to bring our loving attention to it. Excellent! Love this – beautifully put.